Mathew: The tagline for this film says it all, "Pretty damn spectacular!" Helm: I enjoyed this film more than I can say, but I am curious why people are not taking it more seriously. Mathew: What do you mean? It's getting pretty good reviews. Helm: No, I mean, I am surprised that the audience did not immediately begin mobilizing to fight the threat of trolls now that they know trolls are real. Mathew: Okay, Helm. I know the movie looked like a documentary, but it was really fiction. It wasn't real. It was a mockumentary. Helm: The deuce you say! I watched the film and it was real! Mathew: Helm. We've had this talk before. Those were special effects. You can't get all up in arms about monsters in the movies. They're just pretend. Helm: I recognize special effects now. I can tell the difference between a giant, animated robot from space, a man wearing a rubber mask on his head and a real, living, breathing troll! I have fought trolls before Mathew! The ones depicted in this film were no special effects! Mathew: Dude. They were fake. Helm: Clearly they were not fake. The trolls were real, the filmmakers are in mortal danger and I believe we should set out at once to rescue them! Let us ride! Mathew: There you go getting all thee and thou again. The thing is, if I don't "accompany" you, you ain't going anywhere. Last time I checked, you still don't have any legs. Mathew: Look, dial it back a bit, Helm. The film is a fake. It says so on the official website. Mathew: Even the guys who made the film say it was just for fun. Mathew: Okay, you mull that over. I thought the film was awesome. It was fun, funny, fast paced and freaky-cool. The effects were good, the acting was good, it had surprises and laughs. Best of all, even though it was shot in a cinéma vérité style, like The Blair Witch Project, it didn't make me want to throw up all over the place like I did at Blair Witch. Jill was cleaning puke out of her hair all night. 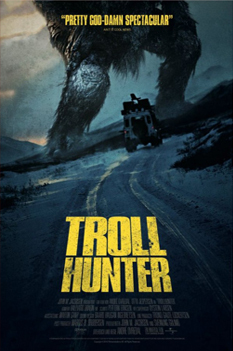 Plus, there's a bunch of actual stuff that happens in Troll Hunter, whereas the Blair Witch thing was all atmosphere. Anything to add, Helm? Four and a Half Flaming Sword!! Mathew: Helm. You can let it go now. It wasn't real. I promise. I'll show you the website. Helm: I tell you, Mathew, those trolls were real. Helm: Yes, Mayhap! Mayhap the website is a carefully engineered ploy by the Norwegian government to cover up what is really going on. A sort of damage control effort to cast doubt on the veracity of the film? Mathew: Let it go, bro. Helm: I AM NOT YOUR BROTHER!